Can Lonzo Ball Coexist With LeBron James in Los Angeles? Lonzo Ball is not the prototypical LeBron James sidekick but he is proving he is capable of being one. The Crossover analyzes the interesting dynamic between James and the second-year point guard. It wasn’t just the scenery that changed for LeBron James when he packed his bags and headed to Los Angeles this summer; it was the roster around him, too. The King spent his Cleveland tenure largely surrounded by spot-up shooters with a nominal center, assuming nearly all of the Cavaliers’ playmaking duties after the Kyrie Irving trade. It’s been a near-180 with the Lakers. Los Angeles’s free-agency additions were headlined by Rajon Rondo and Lance Stephenson, two solid playmakers devoid of a jump shot. The Lakers jettisoned stretch five Brook Lopez in favor of JaVale McGee, further limiting their options from beyond the arc. The flipped roster construction raised eyebrows, but after watching James run out of gas in the 2018 Finals, adding pieces to shoulder the playmaking load was expected to preserve James’s body through the season. The Lakers’ shooting limitations extends to their young core as well, most notably Lonzo Ball. The former No. 2 overall pick shot an ugly 36% from the field and 30.5% from beyond the arc in 2017-18, armed with an unorthodox shooting motion prone to bricks. And while his jumper wasn’t what impressed scouts entering the draft after his freshman year at UCLA, his rookie struggles provided concern over his fit next to James. Would Ball be able to mold his game around LeBron, or would he soon be shipped to a new location out of the Staples Center spotlight? James didn’t vocalize any worries on the matter upon joining the Lakers. In fact, James gave Ball his blessing and a confidence boost to boot. In September LeBron said Ball was “destined for greatness”, and has spent much of the early season encouraging Ball to be more aggressive. James is employing some hyperbole, but his point still holds. While Ball is not the prototypical James sidekick, he has already meshed well with the Lakers star, and could evolve into a reliable second option for years to come. Ball’s numbers have yet to jump off the stat sheet with Los Angeles. He’s averaging just 8.2 points per game and 4.8 assists, which is only eighth on the team in scoring. Yet it’s the spaces in between the box score where Ball excels. Outside of James, Ball is the most well-rounded player on Los Angeles's roster. Ball's skillset is headlined by elite court vision, and he is quick to sling the ball up the floor in transition or make the extra pass in the half court. Ball is the king of the hockey assist. The second-year pro is a strong cutter and an upper-echelon lob threat on either end, both capable of flicking the ball to James from 20 feet out and sprinting toward the tin on the backdoor. The pair have already made their fair share of highlights. The rave reviews regarding Ball’s basketball intelligence entering the draft weren’t overstated. He sees the court like few others. Ball seems to have addressed his jumper over the summer. He’s converted a respectable 35.1% of threes in this season, a mark that should be sustainable. Ball’s triples feel more in rhythm this season, launched without hesitation. You could see the gears turning as teams dared Ball to shoot last year. That’s dissipated in 2018-19. The metrics back up Ball’s perceived impact. Five of the Lakers’ top eight three-man lineups by net rating feature Ball, including the top-two trios (Ball, Brandon Ingram and Kyle Kuzma, followed by Ball, James and Josh Hart). Both of Los Angeles’s top-two lineups by offensive rating include Ball as well (minimum 20 minutes), with the top lineup consisting of James, Ball, McGee, Ingram and Kuzma. That quintet should see heavy minutes together down the stretch and in the postseason should the Lakers extend their season past April. Ball would have been a likely trade chip had he struggled more to start the season. He turned 21 in October and won’t hit restricted free agency until July 2021, showing flashes of brilliance through his rookie season. Trade scenarios were being cooked up before the year even began, with trade machine aficionados working hypothetical deals to send Damian Lillard or Kemba Walker to Los Angeles. With Ingram nearly untouchable, Ball was thought to be expendable, especially if James’s patience waned anytime soon. Los Angeles won’t meddle with its young core for now, though. 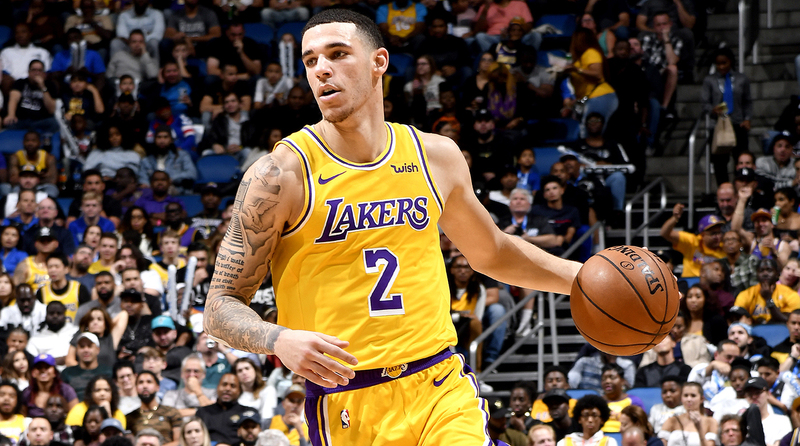 The Lakers have weathered an early storm and sit at 11–8 after Thanksgiving weekend, winning three straight before a sleepy Sunday afternoon loss to the Magic. Los Angeles sits in the top half of the league in both offensive rating and defensive rating. James seems downright cheery most nights, a welcome sign after concern in October and early November. There won’t be a cleaning house in Los Angeles like there was Cleveland during last season’s trade deadline. The Lakers may tinker with their roster in the coming months, but the youngsters are here to stay. Expect Ball to continue to grow alongside James as the calendar turns to 2019, and make for a successful—albeit unlikely—sidekick heading into postseason play.